Oral History: 2004, 7 pages. A transcript of the interview with John R. Lewis conducted on June 10, 2004, as well as selected audio and video clips from the interview are available on the Academy of Achievements website: http://www.achievement.org/autodoc/page/lew0int-2. Oral History: In the Grace Towns Hamilton Interview, 1977, 1 audiotape. Oral History: 2001, amount unknown. 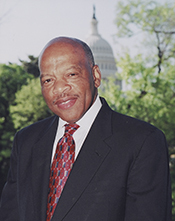 An oral history interview of John Lewis conducted on April 25, 2001. Oral History: 1967, 175 pages. The interview with John R. Lewis, third chairman of the Student Nonviolent Coordinating Committee (SNCC), includes recollections of student sit-ins in Nashville, Tennessee in the early 1960s. John R. Lewis also discusses the founding of SNCC and its activities, including Freedom Rides and demonstration in Selma, Alabama. Recalls his role in the March on Washington and his association with Martin Luther King Jr. Restrictions: The record of this tape may be read in the repository. No quotation or citation during the lifetime of the oral author without his written permission.